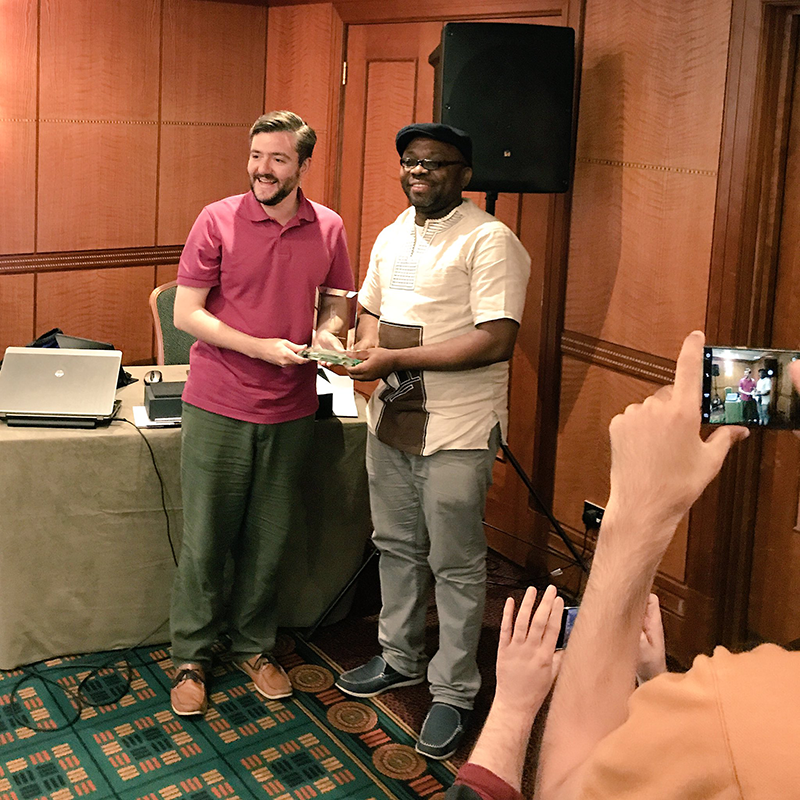 At the recent IHEU General Assembly 2017, we made two awards to commend the remarkable efforts of two activists who have had an incredible impact in their chosen fields. 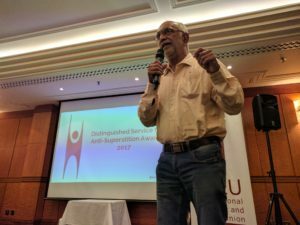 On behalf of the IHEU Board, the president of the IHEU, Andrew Copson, first gave the commendation for a special, posthumous Distinguished Services to Anti-Superstition award granted to the celebrated rationalist leader Narendra Dabholkar, who was killed in August 2013. Later, the president awarded the annual Distinguished Services to Humanism Award to stalwart humanist activist, writer and academic, Leo Igwe. The text of each commendation and responses follows below. The Board has decided this year to recognise with a special, posthumous award the life, the work and the achievements of our colleague Narendra Dabholkar. A medical doctor by training and profession, Dr Dabholkar plunged into anti-superstition work in 1983 and built a concrete movement in his home state of Maharashtra. He became a central player in the organized rationalist movement within India: He was editor of Sadhana magazine devoted to the propagation of progressive thought, he was founder of the Maharashtra Forum for Elimination of Superstition which joined the IHEU, and he served as vice president of the Federation of Indian Rationalist Associations (FIRA), another IHEU Member Organization. Dabholkar’s work over many years confronted and exposed the fraudulent practices of babas and swamis by explaining the science behind so-called miracles, often used to defraud some of the least well-off members of society of their money or possessions. Dabholkar organised teavelling troops of activists travelling all over the state, to disabuse those who might become victim to the fraudsters. Narendra Dabholkar campaigned at a political level too, with great erudition, calling for laws to outlaw fraud based on superstition and so-called ‘black magic’. After eighteen years of his campaigning for the anti-superstition bill, and with his murder fresh on their minds, the state government finally enacted the Anti-Superstition and Black Magic Ordinance into law within a matter of days following his death — this is one of the tragic legacies of his extraordinary life. 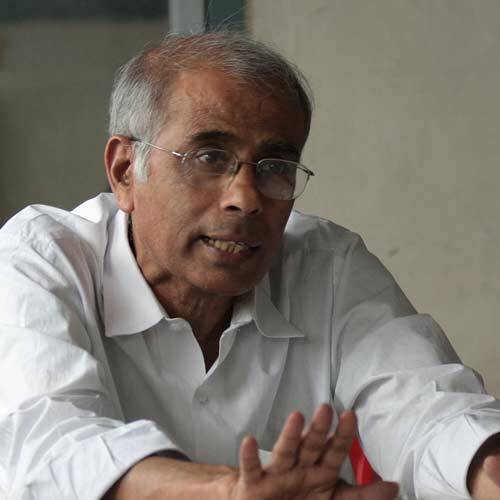 Narendra Dabholkar is not the only rationalist to have been targeted in India, and not the only rationalist to have been killed, either, during the current long-term trend to irrationalism and authoritarianism into which India is still plunging. But his death should not simply be seen in retrospect as a “warning sign”. His life and work must be remembered as an act of courage. He once protested, in the face of the threats he was receiving against his life: “I’m fighting within the framework of the Indian constitution and it is not against anyone, but for everyone.” It is this universalism, this great humanism, which his attackers, and his opponents generally, obviously fail to comprehend — and for which he must be remembered. A campaign now exists to take the Anti-Superstition and Black Magic law – which through his sweat and blood he brought into being in Maharashtra state – and replicate it at the national level: to criminalize the fraud and abuse of the godmen and to protect their innocent victims. I am sure everyone here would support this campaign and today we honour Dr Narendra Dabholkar with this special 2017 Distinguished Services to Anti-Superstition Award. Narendra Nayak responded with a tribute. And Narendra Dabholkar was my vice president for two years. And his … mission was, last time we met he told me: I have organized conferences at the district level, state level, national level; I would like to organize an international conference. How do I go about it? But by the time he could never go about it, because he was killed. On behalf of Maharashtra Andhashraddha Nirmulan Samiti, I thank you very much for remembering Narendra Dabholkar these four years after he was killed. After that, one more was killed, Govind Pansare [killed in February 2015], and then two years back, one more, his name was M.M. Kalburgi. And Kalburgi was killed just because he distinguished between two religions… I mean it’s a bit complicated but they wanted him out of the way. And Farook was killed for apostasy, that was six months back. Because he was a Muslim who denounced God. He left Islam… Three years before that, one man’s arm was amputated by Muslims because he made a question paper in which there was something about Muhammad. These are the circumstances which we are facing in our country. And we are prepared to face it because there is no way out. We cannot run away from these problems. We have to face them. We have to make our people think, particularly the younger generation, for that at least things will be better in the coming days. So, thank you very much for giving me all this attention. And once again, on behalf of Maharashtra Andhashraddha Nirmulan Samiti, I thank the IHEU. Now, as in previous years you know we like to hold the name of the award recipient to the end. But I think this is going to be quite easy to guess – so maybe try and hold back and just… act surprised at the end, okay? It is a great honour to be able to give the award today for Distinguished Services to Humanism to someone who has been a great friend, ally and colleague at the IHEU for many years. He has dedicated much of his life so far to fighting the superstitions and irrational traditions that give rise to the grave violations against human dignity. And not only has he been disabusing and trying to educate his fellow countrymen of certain superstitions – the work of the skeptic if you like – he has also been working with and supporting the victims of ‘witchcraft’ accusations, for example – which we might call the work of the humanitarian. These two impulses, the skeptical educator and the humanitarian, make him the perfect recipient for this award for Distinguished Services to Humanism. Whilst working locally on ‘witchcraft’ accusations and related abuse, he served for some years as the international representative of the IHEU… for West Africa, and participated at the African Commission on Human and People’s Rights on our behalf. Already a graduate in philosophy, and an extremely well-informed activist and campaigner, our award-winner has since taken his work documenting and understanding ‘witchcraft’-related violence and abuse into academia, and he now holds a recent Ph.D from the University of Bayreuth in Germany. Organizationally, he has not only worked with IHEU but is really the founder of the humanist movement in his home country of Nigeria, he’s worked with the Center For Inquiry and the James Randi Educational Foundation. And in addition to his work on ‘witchcraft’ and ‘human sacrifice’ and other such malign practices, he has also highlighted the abuse of Nigeria’s regional government structure by religious groups and leaders, which gives rise to localized enforcement of religious codes. All this work has not been an easy vocation – He’s been threatened and maligned for example by some of the churches who perpetrate ‘witchcraft’ and ‘sorcery’ accusations. He’s been arrested during human rights fieldwork on several occasions, once being imprisoned and beaten by police before being released without charge. Perhaps most depressing and infuriating, members of his own family were attacked at home in reprisal for his work. So it is with true admiration, as well as great personal warmth, that we recognise today the activism, the personal commitment, the courage and the passion of this remarkable humanist, as we give the 2017 Distinguished Services to Humanism Award to Dr Leo Igwe. Thank you the International Humanist and Ethical Union for selecting me as the recipient of the Distinguished Services to Humanism Award for 2017. I dedicate this award to all humanists at risk around the globe. I feel humbled by this honour, although I must acknowledge that if one goes through the list of past recipients, it is obvious that the contributions that I have made to international humanism and to organized humanism are quite small. How would anyone compare my contributions to those of the likes of American philosopher Corliss Lamont, Indian humanists Indumati Parikh and Abe Solomon, British humanists David Pollock, Robbi Robson and my friend Josh Kutchinsky and past IHEU presidents Roy Brown and Sonja Eggerickx? There is no doubt that I have eventually found myself in the midst of humanist giants, and that is humbling. I must state that this award was not actually meant for me. This award rather speaks to the vision that has been there since the founding of IHEU. This is the vision that drove British humanist Harold Blackham and other humanist delegates from across the world to start the IHEU in Amsterdam in 1952. This vision has been the main pillar of international humanism to date—that is the refusal to accept humanism as it is and to try and organize, and mobilize to realize humanism as it should be. It was the same reason that led me to start the Nigerian Humanist Movement in 1996. I was not born a humanist. In fact, I trained to become a priest, not a humanist leader. I had no experience in organized humanism. However, I knew that there was something missing in humanism as it was then. And I did the much I could to supply the missing link and helped move Nigerian humanism towards what humanism should be! Luckily the movement in Nigeria has survived and has remained on course for 20 years and still counting. In fact, we are beginning to see strong signs of humanism as it should be. We have witnessed the emergence of humanist groups and activists who are working and campaigning vigorously to promote an effective alternative to dogmatic religions and supernatural faiths. Two of these organisations, the Humanist Assembly of Lagos and the Atheist Society of Nigeria are now registered with the government! We all witnessed a successful campaign that led to the release of Mubarak Bala whose family consigned to a mental hospital after he renounced Islam. That is humanism as it should be. Then last month, just last month, IHEYO African Working Group, held their African Humanist Youth Day event in Lagos, Nigeria. Yes, that is humanism as it should be! In fact, recently we have seen a wave of humanism-as-it-should-be silently sweeping across Ghana, Kenya, Uganda, Malawi, Zambia, Zimbabwe, Botswana and South Africa. This same vision led me to contact IHEU in the ’90s and to attend the World Humanist Congress in Mumbai in 1999 where I addressed for the first time an IHEU event. I joined the IHEU Growth and Development Committee and later served as one of the representatives in Africa and at the African Commission on Human and People Rights and used the position to raise humanist issues for the first time with state parties in the region. I will never forget the deep feeling I had that day I addressed for the first time the African Commission on Human and People’s Rights. I felt like: Yes! That is humanism as it should be! Let us also not forget that the quest for humanism as it should be led the then-IHEU President, Norwegian humanist Levi Fragell to visit Nigeria, Ghana, and Uganda in 2002. This same vision led IHEU to organize its first General Assembly in Africa in 2004 and sent a strong delegation that included then-IHEU director, Babu Gogineni, to the humanist conference in Ikenne in Nigeria, the same year! IHEU appointed two representatives in the region and secured an NGO status at the African Commission on Human and People’s Rights. IHEU and its member organisations have helped establish and support secular schools in Uganda because humanists understand clearly that without secular education, a secular society cannot stand, without secular education, humanism-as-it-should-be cannot stand. In recent years we have witnessed other changes within the IHEU. These developments give me hope for the future. For instance, we now have IHEU Board representatives from Asia and Africa. That gives me hope. Since 2012, IHEU has been publishing The Freedom of Thought Report that documents the discrimination and persecution against non-religious people in countries around the world including my own country, Nigeria. That gives many humanists across world hope. 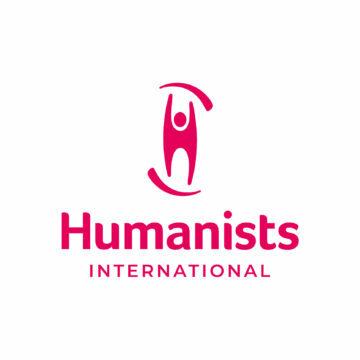 In fact, the latest IHEU campaign to support humanists at risk was a masterstroke and again that gives me hope. So keep moving in the direction of humanism as it should be, IHEU! And be assured of my continued support and contribution to your work and programs for the rest of my active years.